This eye catching extra-large heart shaped crystals made from Swarovski® held in place with a str.. This eye catching extra-large heart shaped crystal MADE with Swarovski® Elements is hel.. This beautifully designed Crown Pendant features a stunning 1.5 CARAT Blue Lab-Created Sapphire G.. This beautifully designed Crown Pendant features a stunning 1.5 CARAT Clear Lab-Created Sapphire .. This beautifully designed Crown Pendant features a stunning 1.5 CARAT Pink Lab-Created Sapphire .. This stunning Rhodium Plated Pendant Features a beautiful 2.33 Carat Blue Lab-Created Sapphire Ge.. 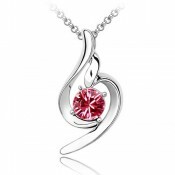 This stunning Rhodium Plated Pendant Features a beautiful 2.33 Carat Pink Lab-Created Sapphire Ge.. This stunning Rhodium Plated Pendant Features a beautiful 2.33 Carat Clear Lab-Created Sapphire G.. This stunning Rhodium Plated Pendant Features a beautiful 2.33 Carat Pink Lab-Created Sapphire. T..
A beautifully designed 4 leaf clover pendant with CZ Crystals is available in 4 colours: &nbs..
Heart Pendant with a ribbon of words saying I Love You Mum will melt her heart especially for Mot..
Our Infinity Love Necklace features two hearts to represent the love between two people and they ..